Sully Elementary’s former and current staff members and students gathered at the school Aug. 21 to celebrate its 50th anniversary. Wayne Mills, who was the school’s first principal at just 27 years old, spoke about how Sully Elementary’s opening was rushed because elementary schools in Sterling Park had quickly become crowded. Mills had ended the 1967-68 school year as the principal of Aldie Elementary and found out a week before Sully opened that he was to be its first principal. On the first day of school, construction crews were still busy working on the campus. The primitive conditions at Sully’s opening meant accommodations had to be made. Everyone packed a lunch and ate in their classroom. Students were kept inside for recess because the playground was a construction site. There was no homework because the students had no books to take home. And when there was a weather emergency, someone had to run over from Guilford Elementary to tell the staff at Sully. But, Mills said, no one complained because they were just happy to have a new school. Last week’s small celebration of the school’s 50th year invited former administrators, teachers and students back to campus. Current Sully students were also welcomed to attend and enjoy lunch with their families, courtesy of a $1,169 grant from the Loudoun Education Foundation and the Claude Moore Charitable Foundation. Volunteers from Christian Fellowship Church prepared the barbecue lunch. The celebration also included a performance by the Park View High School band, a scavenger hunt, and a gallery walk featuring rows of photos from the school’s early days. 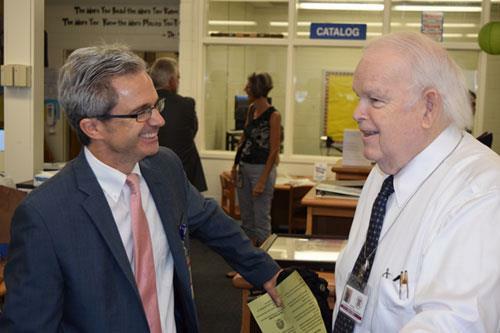 Also in attendance was Bill Raye, who served as Sully principal from 1995 to 1999, and former Assistant Principal Sharon Ackerman, who went on to become Loudoun County Public Schools’ assistant superintendent for instruction from 1999 to 2014.